OMTEX CLASSES: There is direct relationship between price and quantity supplied. I agree with the statement. This is because the law of supply establishes a functional relationship between the price of a commodity and its quantity supplied in the market. The law can be explained with the help of supply schedule and a diagram. The schedule shows that with an increase in price the quantity supplied is also increasing. It indicates direct relationship between the two variables Price and quantity supplied. When the price is Re. 1 the seller offers only 10 units for sale. When Price increases to Rs.5 he expands supply to 50 units. X-axis represents quantity supplied and Y-axis represents price. Various points from the schedule are plotted on the graph join those points we will be getting supply curve which is called as named as SS. 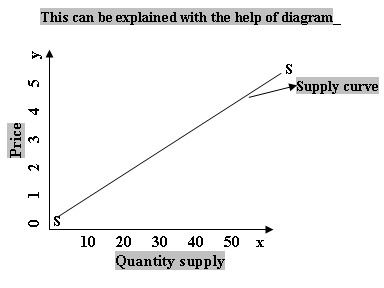 SS sloped upward from left to right showing direct relationship between price and quantity supplied. This happens when price is more, supply is also more and when price is less, and supply is also less.